If you’re looking for a paintable chalkboard, we can help. 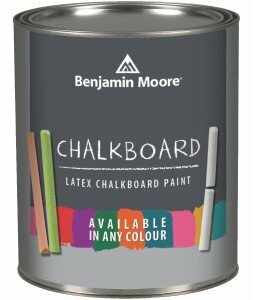 We carry chalkboard paint in a variety of brands including Benjamin Moore, Rustoleum, Magnamagic, and Sheffield Bronze. With the ability to paint a functional chalkboard anywhere you want, chalkboard paint is an incredibly versatile and unique product. It’s virtually identical to a regular chalkboard, you can write and erase using standard chalk and erasers. Application is a breeze, simply follow the instructions on the appropriate product to paint over any primed surface, most clean up easily with soap & water. You’ll have your very own custom chalkboard in no time. If you’re looking for a magnetic chalkboard you can do both at the sametime using Magnamagic. Any paintable surface can be transformed into a chalkboard, the possibilities are endless. Eco-friendly message board for your family or business. Display daily updated quotes, “menu of the day”, mottos, sayings in your business or home. Create a fun space for children to let their artistic expression roam free. Organize cupboards by painting chalkboard labels on them. Chalkboard paint is available in a variety of paint brands including Benjamin Moore, Rustoluem, and Magnamagic magnetic chalkboard paint. For further information on feel free to give us a call. Need a hand? From finding the right colour to complex project advice, we’re here to help.